A look at the use of electricity in the 1950s garage. Homepage. 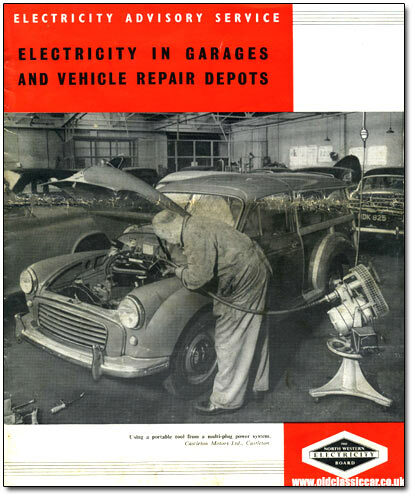 This page: This booklet from the late 1950s looks at how the use of electricity has transformed motor businesses. Electricity in Garages and Vehicle Repair Depots. This booklet was put together by the Electricity Advisory Service, in conjunction with the North Western Electricity Board. Within it's pages, it looks at how the use of electricity in garages, workshops and vehicle depots has transformed businesses. It also offers suggestions to smaller concerns looking to expand their range of services, by the adoption of further tools and equipment that rely on a mains supply. The booklet is illustrated throughout with photographs supplied by various companies in the North West region at the time of its publication, 1958. The cover shows a scene at Castleton Motors Ltd, where various cars are seen dotted around the workshop. In the foreground is a Morris Minor Traveller, having something under its bonnet attended to by a chap in grimy overalls. He's using a compressed-air tool connected to a Morrisflex mobile compressor. The Morris would appear to be un-registered, whereas the P4 Rover in the background is registered MDK 825, a Rochdale number. Lighting is the first subject covered, with various suggested levels of illumination for different areas in a typical garage. For instance, in a general maintenance area, a figure of 7ft-candles, measured with a suitable light meter, was the recommendation. An engine repair bay would be better being illuminated to 20ft-candles, and a paint/finishing shop to 15-30ft-candles depending on the stage of paint repair work being undertaken. There is a photo of the William Knowles & Sons Ltd car showroom, which featured all the latest lighting ideas. Glistening in a row are various Rootes Group products, including examples of Hillman Minx and Humber Hawk. Exterior lighting is shown to good effect at a Rootes Ltd service garage in Manchester, the forecourt complete with many petrol pumps brightly illuminated, no doubt impressing any motorists that happened to be driving back home from work. Underfloor heating often crops up on home makeover programmes on TV, but even in the 1950s some of the smarter motor-car outlets were installing it in their newly-built showrooms, whereas older established buildings were often warmed with night storage heaters. A very smart showroom, belonging to Joseph Cockshoot & Co. Ltd of Bury, is shown with just such an underfloor heating arrangement. Gleaming in this BMC showroom is a pair of Morris Oxfords, sandwiching a Minor tourer. Hot water systems are also given a mention, as is the ".. regular tea brewing ritual ..". Rootes are again featured - they must have had quite some operation in the Stretford area of Manchester, as their standalone "all electric cafe" is shown, a modern (for 1958) glazed box of a building, incorporating a raft of food- and brew-making facilities. Swanky garages, really looking to impress their clientele, might have opted for luxuries such as electrically-operated roller doors. These could have been operated either via pushbutton, as often is the case even now, or by a photo-electric cell, triggered by the flash of an arriving car's headlamps no less. Whether the dim flicker of a 6v headlamp would have been sufficient, it doesn't say. Compressors are next to be considered, and were probably an essential item in any large garage where compressed air, or a pumped supply, was required. The latter was especially relevant if fuel was supplied to passing motorists, in which case special legislation applied. Mention is given of a revision due to come into force regarding Petrol Spirit Licences on 1st January 1960. A photo of an Austin Cambridge parked outside T. Eadington & Sons Ltd of Wilmslow, Cheshire, shows a smart modern garage building with an array of petrol pumps stood outside. The reader is now encouraged to consider the types of power tool that might be required in a garage business, with car lifts being just one handy bit of kit given a mention. Two small images featuring Standard 8s parked in the workshops of The Hollingdrake Automobile Co. Ltd of Stockport are shown. This garage building is still in existence. It had been a Standard Agency even in the pre-war years, and in later times it became a Jaguar dealership, until quite recently still operating under the Hollingdrake name. A photo of a restored pre-war Dodge recovery lorry, ex-Hollingdrake, can be seen on this page of this site's classic vehicle photo section. The Standards are registered HDB 933 and KJA 372, both Stockport-area numbers. Did either survive, or did they both end their days crushed into little cubes, before being transformed into a 1970s' washing machine? Other items of equipment discussed include battery chargers and boosters, generators, drills and lathes. In some areas of the country it was essential that some garages were able to work on electric vehicles, as they were very popular at the time for door-to-door delivery work. Electric milkfloats can still be seen in action today in some towns, but in the 1950s they were much more prevalent, as were electric vans delivering other products to outlying areas of the district. A line-up of electric floats are shown being charged at their home base, in this case that of Preston Dairies. A number of other images, supplied by garages across the region, demonstrate other uses for electrical equipment in the workshop. Staff at Barton Townley Ltd of Lancaster, are shown using a portable electric wheel balancing machine on a Mk2 Zephyr, and a sanding disk is demonstrated in the hands of a worker at C.G. Skipper Ltd of Burnley, as he sands down a repair that he's made to a Ford 100E Squire's rear tailgate (reg. FHG 23). Spray equipment is demonstrated at H. E. Nunn & Co. Ltd in Manchester, where two partially-masked Ford 100E saloons are being re-sprayed. The sprayer is in his normal clothes, sleeves rolled up, with no sign of a face mask anywhere. A Hillman Minx is shown perched aloft on a carlift at William Knowles & Sons Ltd, and a Mk2 Consul (TVM 224) is shown having a quick clean-up at H. E. Nunn & Co. Ltd. in Manchester. The final two pictures in the leaflet both feature lady garage workers. A welcome sight no doubt, especially when compared to the grease-laden, Woodbine-chewing spanner jockeys you might have encountered in the less salubrious backstreet garages of the 1950s. The first, a young lady wearing dungarees, is busily vacuuming the interior of a Ribble Motor Services coach, whereas the second fair lady is shown tapping away at C.G. Skipper Ltd's accounting machine. Return to the Motoring Miscellanea section for more car-related odds and ends just like this.